We chose this photo because we once thought that was the coolest-looking uniform in the history of cool-looking uniforms. Don't judge us. Felipe Lopez appeared on the cover of Sports Illustrated before he'd ever played a single college game. 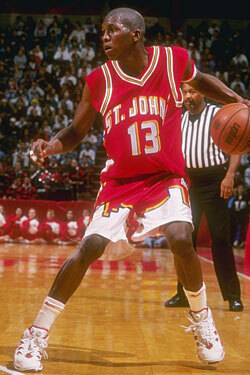 The nation's top recruit, he was going to be the one to return St. John's to glory. But though he graduated as the Queens school's third all-time leading scorer, his Johnnies teams made just one NCAA Tournament, losing in the first round to Detroit in 1998. After being selected with the 24th pick in the draft, he went on to play for four seasons in the NBA, before playing in Spain, Venezuela, Mexico, and his native Dominican Republic. Today, he's an ambassador for NBA Cares, and the Sports Section caught up with him last night at the NBA Store, where he helped Allan Houston distribute coats to kids from Theresa's Haven, a Bronx homeless shelter. You seem to really enjoy working with kids. Yeah, I like doing it because the NBA has given me an opportunity to be involved with the community. It feels really good to come from playing basketball and doing whatever I did on the basketball court. But that's history right now. It doesn't matter. What matters is how much we touch lives through just our time and through our spirits and just preaching the word of basketball. I'm community-oriented, coming from a big family, and have a foundation in the Domincan Republic with 300 kids. I want them to enjoy themselves and see that this is something we love doing for them. Hopefully I'm building bridges between the Dominican Republic and the NBA. I saw a few minutes ago that a few people asked you to sign copies of the Sports Illustrated with you on the cover. That must have been a lot of pressure, coming into college. Yeah, they pulled out like four different copies! I was like, "Where do you keep these things?" But for me it was fun. It was a period of my life where a lot of things were going well. Coming from high school and winning the city and the state, to be chosen for the cover of Sports Illustrated was shocking, but it was a great experience because it was able to send a message out — not just to a lot of the immigrants that come to this country, but for myself to be able to touch lives. Do you think it was too much pressure? I don't know. I live in New York. Here in New York, we always do everything big, and we expect the best from people. And expectation was good. I would not say that it was not fair, but for me I have to take it for what it was, and it was a great opportunity that was put in my path. Some people would say that I didn't perform to my level, but I feel pretty comfortable with everything I've done in my career. How do you look back on your career at St. John's? You were, after all, the third leading scorer in its history. I guess, you know, you can't look at things from an individual point of view. Because if I looked from an individual point of view I would feel fulfilled that I did well — third all-time behind Chris Mullin and Malik Sealy. I still got records for most threes. And I guess that doesn't count because what was expected from us as a team, to be able to go deep into the tournament, and it just so happens that didn't happen for us. It's a team game, and it doesn't matter how well one individual does. It's all about the team. Do you have a copy of that Sports Illustrated? Nah. I do have a picture of it. It's funny because some people actually say that that was a camera trick. It actually was real. You're shooting on boat down by the Hudson River and they had us jumping on a trampoline doing different poses. It was real as it gets. How much do you keep up with the St. John's program these days? I went back and I spoke to the coaches. I try to go back as much as possible. I was away from New York for a while, but since I'm here I definitely want to be more part of it, because it's important for some of the young guys to see someone that played at the school to come back and just be around. I was fortunate to play at the time that Malik Sealy and Chris Mullin were able to come back to St. John's, so that gave us a lot of direction to what we wanted to do with our careers. Would you want to coach there? Yeah, I think that would be great. Depending on the opportunity: You have to respect what the coaches are doing there, so for me to say, "Yeah, I just want to go out there and coach," that wouldn't be fair. But if they gave me the opportunity, yeah, of course, I would love to be part of that whole tradition and turn everything around. Why don't you think St. John's is getting the top recruits from New York anymore? I think that they see themselves getting a better opportunity somewhere else, but that's not necessarily true. I think by winning, it brings more excitement to the program. We have had some tough years, but they will become better. And that's an important thing for us, to establish that tradition that we have. When you moved to New York, were you a Knicks fan? It was funny because I used to always go to the Nets games and watch Kenny Anderson (who I followed in high school), and Drazen Petrovic, and Derrick Coleman. But being from New York, you always want the Knicks to do well. When they played against Chicago, and Jordan was beating down on the Knicks, and even when they made it to the final, you're always rooting for the Knicks because we're here. I just have a deep respect for them because, living here, you always want to enjoy having a winning team.